Many people spend more than one hundred dollars per month for heating, air conditioning and hot water. A geothermal system uses about one-fifth of the electricity that conventional systems use, and as a result, a person can lower their energy bills by up to eighty percent. Geothermal systems are particularly long-lasting, and a geothermal system usually requires far fewer repairs than a conventional system in the long-term. Despite the fact that companies have been installing conventional air conditioning units and heat pumps outdoors for decades, geothermal systems are installed indoors, and as a result, they are protected from wind, rain, snow and vandalism. 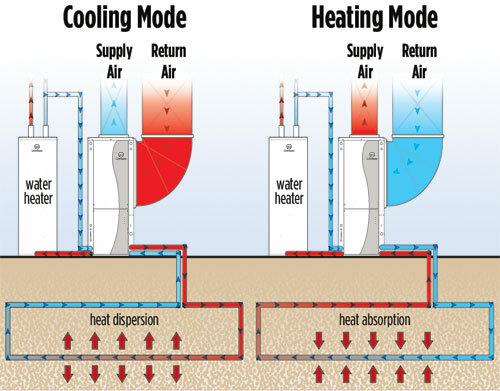 Conventional systems can provide sporadic blasts of cold air or hot air, and a home that has a conventional system will likely have several warm spots or cold spots. By distributing air precisely and consistently in the home, geothermal systems eliminate cold spots and hot spots, and they provide enhanced comfort in the entire home. Most furnaces and air conditioning units make some type of noise, but geothermal units are particularly quiet when they are operating. Unlike most other heating and cooling systems, geothermal systems do not emit carbon dioxide or carbon monoxide, which are both greenhouse gases that can lower the quality of the air in the area in which they are emitted.